The interconnected challenges at the nexus of energy, water and food will strongly shape the future. These interconnections will cause new and sustained turbulences, which require innovative approaches to make our societies more resilient. As a society, we will have to understand these systems better and explore opportunities for companies, governments and NGOs to alleviate stress and build resilience. The stress nexus! challenge is a board game, but one with emergent rules. In a mere hour, you will move from an outside observer of the stress nexus to one of its key actors. You may play a company, seeking a secure market for your production. You may play a country desperately short of water. You will face land shortages, real or imagined. Innovation, boycotts, partnerships, price fluctuations, free trade, bad harvests, turbulence: it’s all in the game. Or is it just a game? The game starts of with a ten minute introduction, explaining the rules of the game. After the introduction the 12 players engage in multiple rounds of gameplay. Each round consists of trading-time and banking-time. During the trading players can acquire assets and trade resources amongst players. During banking the results of the trading round are monetarized. After the gameplay, the learnings are captured through a strong debrief in which players reflect on and learn from their outcomes. The Resilience Action Initiative developed Nexus! to create an environment for experiential learning. The developers of Nexus! have used a rapid-prototyping approach. The idea for the game was first conceived in January 2013. The final product was available in May of that year. In only four months, five different prototypes were built, tested and adjusted. Weekly tests were followed by a fast evaluation of lessons learned and redesign. This approach combined rapid progress with the incorporation of views from many different stakeholders within the Resilience Action Initiative, who acted as test players. Nexus! has drawn upon experience with the design of the Perspectivity Game, a simulation of climate change dynamics (inspired amongst other by the tragedy of the commons). The team further took inspiration from games like Carcassonne, Settlers of Catan and Risk to design the fun factor into the game. In addition, it applied key concepts from the valuable game development guidebook “A Theory of Fun” (Koster, 2005). The element of simultaneous player decision-making, different from most turn-based games, was taken from Diplomacy. 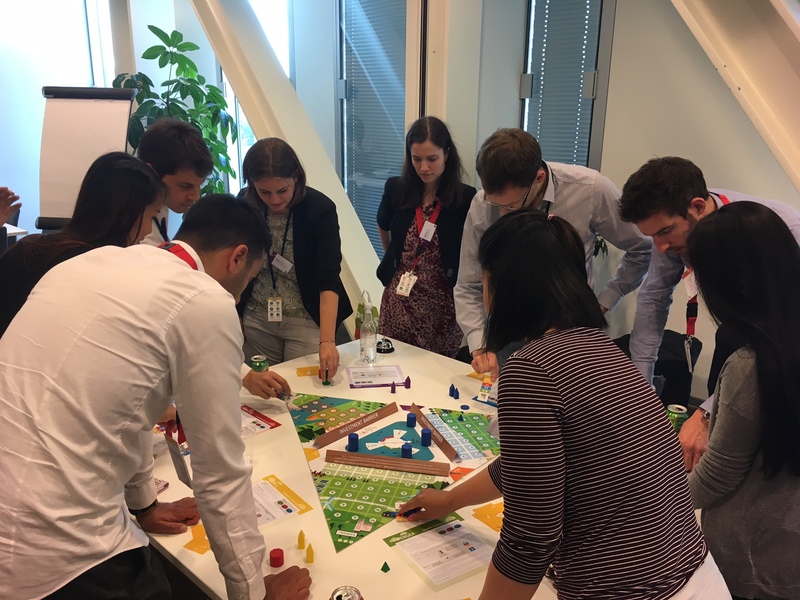 Lessons on social gaming were learned from the games Ökolopoly and the Horn of Africa Risk Transfer for Adaptation (HARITA) project. 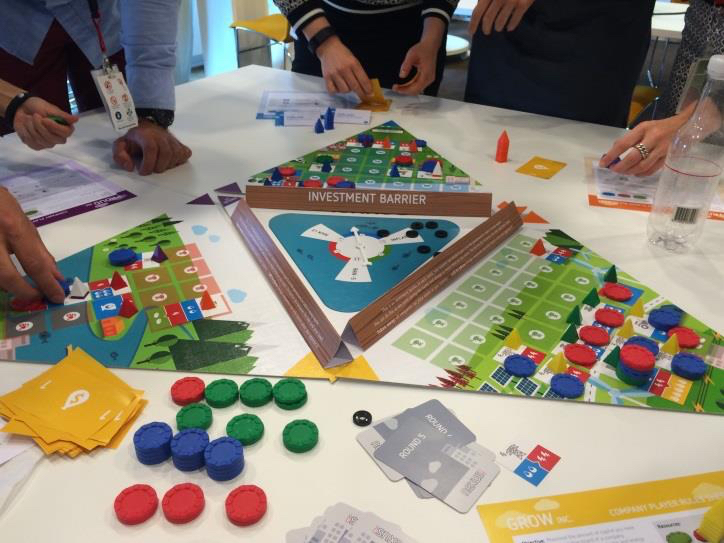 None of these existing games, however, combined the theme of energy, water and food resources with a design focused on resilience strategies and collaboration. The Nexus! 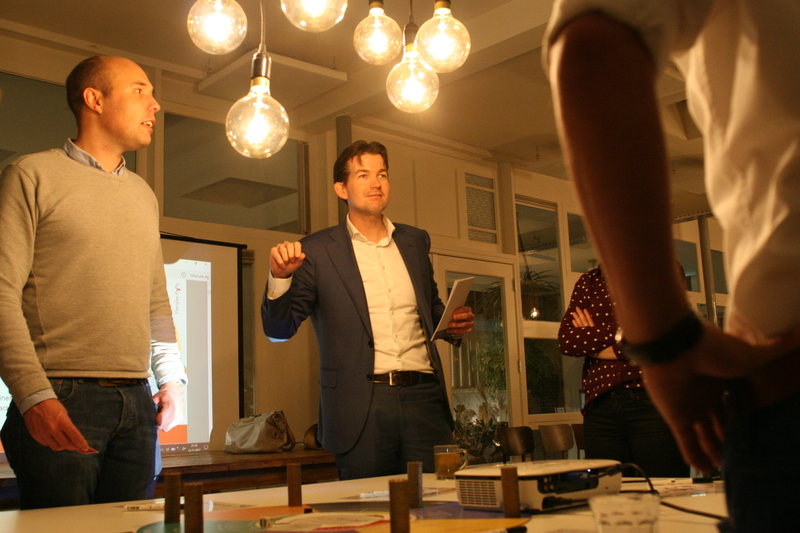 Challenge lets its participants stand in the shoes of politicians and CEOs who jointly shape an economy that has to provide energy, water and food to its cities. From trade boycotts and bad harvests, to water shortages and plant viruses: the players face turbulence just like in the real world. The Nexus! Challenge provides a crash course in identifying when collaboration is required and shows the value of understanding the systems in which you operate. The rules of the games are not fixed and evolve during the game. This puts the players in a position where they need to deal with uncertainty. It makes applying simple tactics based on forecasting future developments next to impossible. This simulates the turbulent behaviour of systems at the energy-water-food nexus, and the often ambiguous ‘rules of the game’ in the real world. Nexus! challenges are offered in a three-tier tariffsetting: Profit-sector €89,- p.p. Semi-profit sector €59,- p.p. Non-profit €29,- p.p. Licensing is possible under special arrangement, of which a Training of trainers will always be part. Perspectivity uses the proceeds of Nexus! Challenge sessions for further investment, with the objective to give as many young people as possible the chance to learn valuable lessons about navigating complex systems. To run/play this game go to the game’s website and contact its creators.